This is game 7 of the 39th Kisei title match. The game was played between Iyama Yuta 9p and Yamashita Keigo 9p on March 19 and 20, 2015, in Niigata, Japan. Iyama Yuta 9 dan (left) and Yamashita Keigo 9 dan at the 39th Kisei final. Iyama got off to a good start in this match. He won the first three games, so the score was 3-0. Everyone probably thought that the Kisei wouldn’t be much fun this year. However, the situation changed dramatically when Yamashita started to catch up. Yamashita won game 4, and that was the turning point in terms of regaining his confidence against Iyama. He won games 5 and 6 as well, and eventually the match was tied at 3-3. In general, we’d expect Yamashita to have the advantage in a title deciding game like this, because he was already on a winning streak. Iyama Yuta with the sealed move, at the end of the first day. 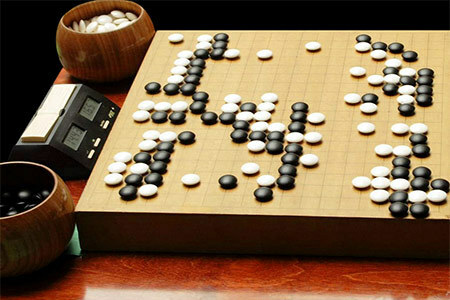 Iyama Yuta is indisputably the strongest Go player in Japan at the moment, and he held four major titles, including the Kisei, when this match was played. He used to hold six of the seven major titles, but he lost the Tengen to Takao Shinji 9p and he also lost the Oza to Murakawa Daisuke 8p in 2014. Iyama showed his strength at the 16th Nongshim Cup, in early 2015, against top Chinese and Korean players. He defeated Park Junghwan 9p, who is currently #1 in Korea, and also defeated Mi Yiting 9p, who was the winner of the 1st MLily Cup. Iyama proved that Japanese players can still be competitive in those games. Yamashita Keigo, just before the game. On the other hand, Yamashita Keigo was playing to win his 6th Kisei title. He used to be the #1 in Japan in the early and mid-2000s, and he’s still competitive today. His last title was the 22nd Ryusei in 2013, and his last major title was the 37th Meijin in 2012. This was a great opportunity for him to grasp one more major title. In addition, the Kisei is the biggest title in Japan, and the Kisei is generally regarded to be the top player in Japan, in terms of the traditional Japanese ranking system. Yamashita showed his power and skill in games 4 to 6, and many of his fans were longing for him to win in a reverse sweep. There was a very similar situation in 2011. In the 66th Honinbo final, Yamashita won the first three games against Hane Naoki 9p, who was the challenger, but Hane won the next three games to make it a tie at 3-3. However, Yamashita won the title deciding game, and he defended the Honinbo with that victory. Let’s have a look at the game and see what was happened this time. The conclusion of game 7 of the 39th Kisei title match.